This is the home of “JDM Pedals” Boutique Guitar Effect Pedals. 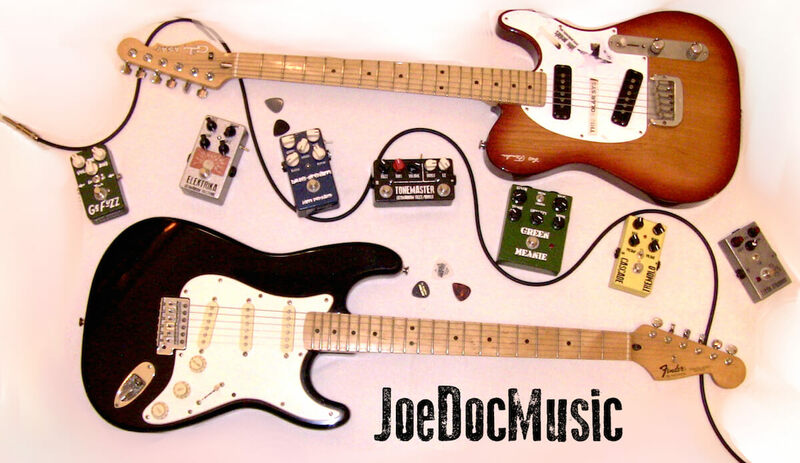 JDM Pedals are Boutique Guitar Effects Pedals Handmade in Berlin, Germany. Some are based on classic circuits with mods and design additions, others are our own creation. We build pedals for working musicians – no need to have expensive gear, but we recommend a solidly built guitar and a tube amplifier for best results. Many of our pedals simply sound their best interacting with a tube amp (In particular the “Fuzz 292”, “Tonemaster”, “Humdinger”, and Elektrika”). The models we offer are quite full featured, but if you’d like a custom pedal, we can do that, too. Just drop us a line, and we’ll try to accommodate requests. We’re also post tips & tricks for D.I.Y. guitar effects. Please write if there’s anything in particular you’d like to see. We use selected vintage transistors, both Germanium and Silicon, paired with modern, high-tolerance capacitors and resistors. Our pedals feature hand-finished enclosures, silk screened graphics, and hand wired circuit boards. All potentiometers are wired NOT connected to the circuit board! The “mojo” of vintage capacitors and resistors isn’t (in our opinion) worth the added noise and potential to fail, some transistors are, however, simply awesome. We use die-cast aluminum enclosures, Alpha Potentiometers, Lumberg DC jacks, Rean/Neutrik audio jacks, Squires Wires, etc. for dependable performance. 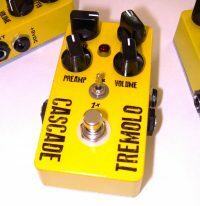 We sell our pedals here on joedocmusic.com, but also on Ebay.com and Reverb.com. See our feedback piling up on Ebay here, and on Reverb here. We’ve also excerpted customer comments and select feedback on each pedal on the individual descriptions so you can get an idea of what’s in store. At this point in time, JDM Pedals is still a “best kept secret” in boutique pedals, keeping our prices low by going word of mouth, and the quality high through small production . On to the Pedals! Details on Guarantee/Repairs and Returns are below. For this very first post in my new D.I.Y. 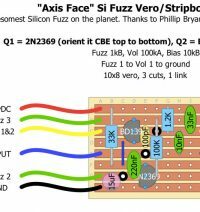 Blog, I'm sharing a vero board layout I created from Jack Orman's brilliant "negative ground PNP Fuzz" circuit. Mr.
Our Pedals are guaranteed for 2 years from the date of purchase. Since we use vintage transistors (some up to 50 years old!) there is the possibility that one can fail or become noisy, etc. You simply need to mail us the pedal (US and German return addresses available) and we’ll fix or replace it. We cover the return postage to you. If you’ve had a pedal for more than two years, there will be a small repair charge for parts and labor. Returns accepted within 14 days. We had a 30 day policy, but some were using this as a pedal rental service. We offer free shipping anywhere in the world, so it was inevitable that a few knuckleheads would abuse that. Henceforth, we feel that 14 days is plenty of time to test your pedal with your rig. There is a $10 restocking fee for single orders, but if you order more than one pedal, there is no restocking fee if you keep at least one. Built in Berlin, Germany – So How Do I Get Mine? We ship worldwide at no additional cost – the posted price is what everyone pays, Timbuktu to Tallahassee. Click on any pedal for a demo video and more info, and order away. These are Boutique pedals, but without the boutique prices. We offer high quality pedals that sound great and won’t break the bank. They are hand made, individually finished, and tested by real people. No machine assembly, and each pedal that goes out must sound groovy to us, or it doesn’t go out. We are trying to keep all pedals in sock, but demand is rising through sales on Ebay, Reverb, and our site, so there may be a few days prep time to assemble your pedal to order. However, at this point there is no long waiting list.